(Photo: REUTERS / Kevin Lamarque)U.S. President Barack Obama walks beside Pope Francis at the Vatican March 27, 2014. 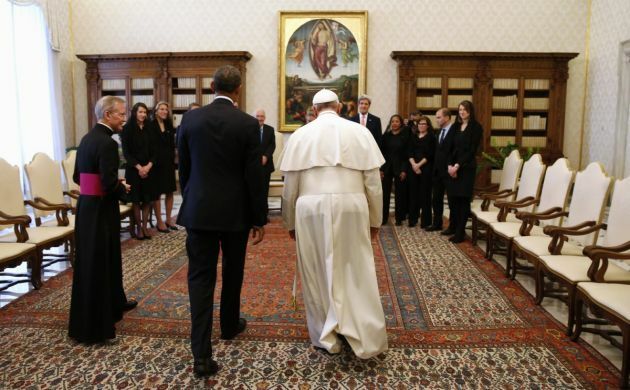 Despite differences on moral issues, Obama was expected to find in Pope Francis a welcome ally on issues of poverty and social justice during their meeting. Obama has sparred with the Catholic Church hierarchy in the United States over his support for abortion rights, gay marriage and the "contraception mandate" that requires employers to provide health insurance cover for artificial birth control. Nearly two years after becoming the leader of the Catholic Church, Pope Francis continues to grow more popular among Americans a new survey has found. Fully nine-in-ten U.S. Catholics now say they have a favorable view of Francis, including nearly six-in-ten who have a "very favorable" view. Francis' favorability rating among U.S. Catholics is comparable to ratings for Pope John Paul II in the 1980s and '90s, and has surpassed any favorability rating for Pope Benedict XVI in Pew Research Center surveys. Among the U.S. general public, seven-in-ten rate Francis favourably as they have gotten to know more about him, non-Catholics also have grown more admiring of Pope Francis. Among U.S. adults overall (Catholic and non-Catholic), seven-in-ten see the pope favorably, up 13 points since the days immediately following his election in March 2013. The share of Americans who see Francis unfavorably has remained relatively steady, and is now 15 per cent. Fewer U.S. adults now say they have no opinion or don't know enough to rate the pope (15 per cent) than said the same in March 2013 (29 per cent). The latest Pew Research Center survey, conducted Feb. 18-22, 2015, on landlines and cellphones among a national sample of 1,504 adults, finds that the Pope's popularity is very broad based. He is most widely admired by Catholics, but six-in-ten Protestants and two-thirds of the religiously unaffiliated also view him favorably. He is viewed more favorably by Americans over the age of 65 than among those under 50, but even those in the latter category express mostly positive opinions about Pope Francis. Both men and women give Francis a positive rating, and Republicans and Democrats are united in their esteem for him. Among Catholics, those who attend Mass regularly give Francis a highly positive assessment. Indeed, almost all Catholics who attend Mass weekly give the pope a favorable rating (95 per cent), including two-thirds who express a "very favorable" opinion of Francis. This nearly unanimous approval of the pontiff is striking even for highly observant Catholics. In five separate readings taken over the course of Pope Benedict XVI's papacy from 2005 to 2013, the highest favorability rating for Pope Francis' predecessor among regular Mass-attending Catholics was 88 per cent, and it dipped as low as 77 per cent. The current survey finds that 86 per cent of Catholics who less often attend Mass also give Francis a favorable rating, including half who rate him very favorably. There are minimal differences among Catholics by gender, ethnicity, political orientation or age when it comes to their feelings toward the pope. Francis is widely admired by Catholic men and women, by both white and Hispanic Catholics, by Catholic Republicans and Democrats, and by Catholic adults under the age of 50 as well as older Catholics. Although Pope Francis' warmest ratings come from his fellow Catholics, majorities of other large U.S. religious groups also view him favorably. Francis is held in high esteem even among religious "nones" (people who have no particular religion or describe themselves as atheists or agnostics). Two-thirds of religious "nones" (68 per cent) now have a favorable view of the Pope, up from 39 per cent who said the same immediately following Francis' election. And the share of religious "nones" who view Francis unfavorably has dropped from 27 per cent to 16 per cent over the last two years. Three-quarters of white mainline Protestants (74 per cent) say they have a favorable view of Pope Francis, compared with 65 per cent in March 2013. Most white evangelical Protestants (60 per cent) also express positive views, though the trajectory of evangelicals' opinions about Francis has been somewhat different from patterns seen among other groups over time. Among most U.S. religious groups, Francis' favorability rating has risen as more people have gained familiarity with the Pope and become able to express an opinion about him. At the same time, the share expressing an unfavorable view has held relatively steady (among Catholics and white mainline Protestants) or declined (among religious "nones"). By contrast, the share of white evangelicals giving Francis an unfavorable rating has increased by 13 percentage points (from 9 per cent to 22 per cent) since the days just after his election. Still, more white evangelicals express positive views about Francis today (60 per cent) than did so toward Pope Benedict XVI, who was generally viewed favorably by roughly half of evangelicals in Pew Research Center surveys conducted during his papacy.